The Lempa River is the longest river in El Salvador. Winding through much of the country, it drains a large region. Rivers in Guatemala and Honduras also flow into the Lempa. A series of dams on the river provide hydro-electric power to the country. As the river flows down towards the Pacific Ocean, it spreads into a broad flood plain known as the Bajo Lempa or Lower Lempa region of El Salvador. JIQUILISCO, El Salvador— A tropical depression in the Pacific, coupled with a weather front stemming from Hurricane Jova in the Atlantic, converged on El Salvador this weekend to cause what appears to be the largest disaster in a generation. Earthen levees along the Lempa River burst as an upstream dam released 9,500 cubic meters of water per second for over 12 hours, three times more water per second than the levees along the river were built to withstand. At press time, the region had seen over 1.2 meters of rainfall accumulate over a seven day period, far eclipsing the historic impact of Hurricane Mitch in 1998 which saw the accumulation of 0.86 meters of rain. Government civil protection authorities estimate that over 48,000 people throughout El Salvador are now crowding into a system of over 500 flood shelters. The number of reported fatalities is currently 32, with two people reported as missing. Areas hardest hit by flood waters include the provinces of La Paz, Sonsonate and Usulután. On Saturday, October 15, the President of El Salvador declared a state of emergency across the nation, with special attention to coastal areas like the Lower Lempa River Basin, located in the state of Usulután’s Jiquilisco municipality. Approximately 40 villages were completely flooded out in that region. Dozens of communities were cut off from contact for up to 48 hours as roads were completely washed away. For the last four days, community groups have been working with local and federal authorities to reach isolated communities and evacuate everyone effectively. In the Jiquilisco area, over 7,000 people are currently staying in schools, community centers and other makeshift shelters. As Irma from ACUDESBAL, a local organization, shared with us, “here in the Bajo Lempa, we’re all one family. People care about each other, and worry about each other.” In the end, it was the young men in the ACUDESBAL-trained rescue group that were able to evacuate stranded community members. While some people wait for evacuation, others have hunkered down where they are. Communities like Los Naranjos, La Pita and Puerto Nuevo, South of San Carlos Lempa in Tecoluca, have been cut off since Friday, when the road flooded. These communities have sought refuge in community centers until the water recedes, but they have no access to food, water or other basic supplies. The only way to access these families, and bring them medicine and sustenance, is by boat. Other communities face yet another problem—the places where they have sought shelter are “unofficial,” not recognized by the government. At these unofficial shelters, there is no government support for supplies. There are shelters throughout the country without enough food, drinking water or sanitation supplies (toilet paper, soap) to provide for people. The Human Rights Ombudsperon, Oscar Luna, has said that Civil Protection has not provided the assistance necessary for those affected. Meléndez, Director of Civil Protection, has confirmed that there are over 10,000 people in “unofficial” shelters who have received no government support. Some good news to report; the communities of Nueva Esperanza, Ciudad Romero, Zamorano and others that are completely underwater have been completely evacuated. We have been worried about a group of 57 people (last night we reported 40, but that number was revised upward this morning) were stuck on the top of the Nueva Esperanza Community center and then the bell tower of the church last night. We just received word that they reached the emergency shelter at about noon today. There's a gallery of pictures at this link. This afternoon a member of Voices staff came across an agricultural cooperative in Mata de Piña where workers were trying to salvage their corn crop that they were almost ready to harvest. Members of the cooperative were working in waist-deep water, picking, shucking, and grinding corn in hopes of salvaging something. This is a bleak reminder of what is to come in the weeks and months ahead. The region has lost all its crops and will be dependent on food aide programs for the foreseeable future. Today – we’ll just focus on the basics… food, clothing, and shelter. The flood waters which have inundated the Lower Lempa region got there after being discharged by the dams upstream. The dams are managed by the the Rio Lempa Hydro-electric Executive Commission ("CEL" in Spanish). 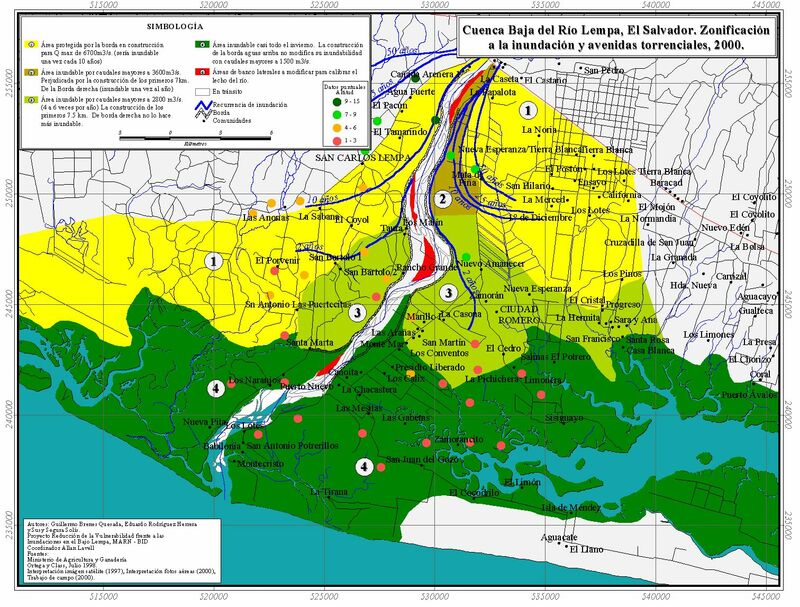 ACUDESBAL (the local inter-communal association) and CESTA (an environmental NGO) published a press release denouncing the role of the September 15th hydroelectric dam in the near total devestation of many communities in the Lower Lempa. The release says “During this climatic phenomena, the CEL again released 11,500 cubic meters per second, but unlike Hurricane Mitch, this amount of water was released for a prolonged period of time, and the river bed is more clogged [than in '98'], which caused flooding from San Marcos Lempa all the way down to Montecristo Island”. The release demands that CEL accept responsibility for their negligence, especially after an interview with the CEL president Irving Tochez, where he claims that CEL is in no way responsible for the devestation, but rather mitigated further disaster by ‘helping to retain water and releasing it in a controlled manner’. According to this afternoon's hydrological bulletin from SNET, releases from the September 15 dam are down to 2300 cubic meters / second, and the river level is gradually going down. The CEL, recognizing that its release of waters inevitably leads to the flooding downstream, has been taking steps to help improve its image. The CEL has been sending relief supplies for families in shelters in the affected areas. The head of the CEL and the Minister of Agriculture made a joint trip this week to meet with community leaders in the Lower Lempa to talk about efforts to minimize the impact of the floods. I have no way to comment on whether the CEL was acting responsibly. Clearly the past 10 days' rains have been unprecedented. With much more rain falling in the drainage basin of the Lempa River than has ever fallen before, officials were certainly going to need to open the floodgates to a large flow of water. Whether they could have released less water, without compromising the safety of the dams, is probably something that only scientific studies with lots of data will answer in the future. Voices on the Border, the SHARE Foundations, and EcoViva are all accepting donations to help in their work supporting the victims of the Deluge of 2011 in the Lower Lempa region and elsewhere.